The easy to use Jitterbug cell phone has an updated version that includes a speakerphone button, can use Bluetooth and offers an “ask a nurse” extra. The “ask a nurse” feature is an acknowledgement that this phone is popular with older users. It costs an extra $4 a month and lets you talk to a nurse about any symptoms of illness you may be experiencing and get advice on whether you should call a doctor or go to a hospital. Regular service without the nurse is $15 a month, though you can find cheaper deals at cellphones.about.com. The Jitterbug has large backlit keys that are easy to read and simple controls for on/off and phone list scrolling. If the user has trouble with the numbers, they can simply press “O” and get a live operator; these are on duty 24 hours, every day. Normal phone calls can be made by dialing or simply speaking the name of someone whose number has been pre-loaded. 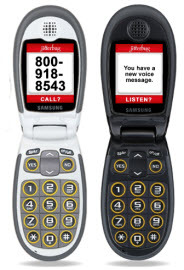 Unlike phones that appeal to young users, the $147 no-contract Jitterbug has no camera and is intended simply to make phone calls and send text messages. What a radical idea. On the other hand, if you want a jazzy phone, Casio has just come out with the Exilim Mobile for $330 with a two-year service contract. A typical service contract runs $60 for 900 minutes a month. This phone has been a big seller in Japan. In the U.S., we could only find it at Verizon dealers. The name of the phone caught our attention immediately because Exilim is the brand name for their line of ultra-slim digital cameras. And in fact that’s what you’re getting: an Exilim camera merged with a cell phone. This provides high resolution photos at 5.1 megapixels and the phone is also “water resistant,” as they say. In practice this means this usually means it still works if it falls into water and you don’t let it sit there.